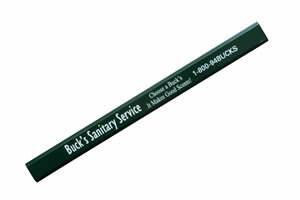 For a workhorse of a pencil and advertising tool, consider custom printing on carpenter pencils. Carpenter pencils offer great value with a flat barrel core and a variety of color options. Add your company name or logo and hand the finished products out at the next tradeshow or fundraiser you attend. What an ideal way to promote a new contracting business or home improvement chain. A flat-out BEST SELLER! An additional $35 per side/per color non-refundable artwork charge must be paid before work can begin. For logos and other artwork, add an additional $25. Our carpenter pencils can include your custom imprint which makes these pencils a great advertising or promotional value. Available in selective paint colors with 1 or 2 sides imprinted. Various imprint colors available. Minimum order is 5 gross (720 pencils). Packed 72 pencils per box (1/2 gross).